Employees' Provident Fund Organisation or EPFO will launch online employee fund withdrawal claim on 3rd July or 4th July. Initially it will be open for selected EPFO offices and later it will be rolled out to all EPFO office. This move is very beneficial to more than 50 million EPFO subscribers. 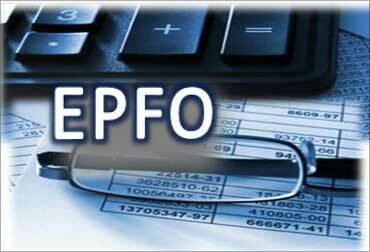 EPFO will setup central clearance house to settle all claims which includes withdrawal and transfers of funds claims. Once EPFO receives online employee provident fund claim then it's EPFO's responsibility to verify the previous employer details and settle the claim. Earlier employee has to contact previous employer to initiate EPF withdrawal or transfer claim. Stay Tuned for more step by step details to initiate your PF withdrawal or transfer claim online. 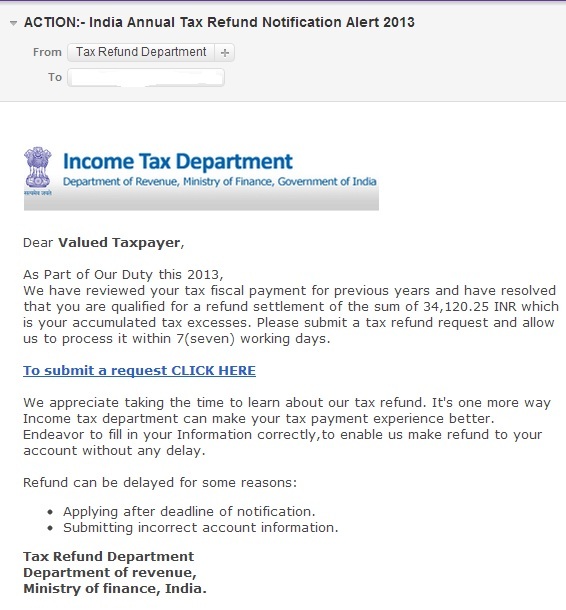 Dear Valued Taxpayer, If you receive email with subject "ACTION:- India Annual Tax Refund Notification Alert 2013" or "ACTION REQUIRED: INDIA TAX REFUND ALERT:- APPLY URGENTLY" then don't be hurry to click the link given in mail and get your refund. It's not authentic email address of Income tax department of india. it's phishing attack to your email address. Once you click on this link then it will open another webpage asking your bank account details with PASSWORD and personal information and it will be certainly used against your interest and you will be at huge loss. 1. If you are expecting some response from income tax department then please go to the authentic website http://incometaxindia.gov.in and check your refund or return status there. 2. If you click on such link and provided your personal information, please change your internet banking password immediately and track your account very closely for next couple of months. it's possible that you are already aware about phishing account but believe me there are thousands people who are innocent and does not know risk about internet banking. Have you ever get cheated like this ? please share your views or experience with us. We have reviewed your tax fiscal payment for previous years and have resolved that you are qualified for a refund settlement of the sum of 34,120.25 INR which is your accumulated tax excesses. Please submit a tax refund request and allow us to process it within 7(seven) working days. Endeavor to fill in your Information correctly,to enable us make refund to your account without any delay. Applying after deadline of notification.